[drm:r100_cp_init] *ERROR* radeon: cp isn't working (-22). OS-X doesn't want to boot any more. It gets stuck on an empty blue screen. Booting it in safe mode (holding down the shift key) or in single-user mode (holding command-S) works, though. 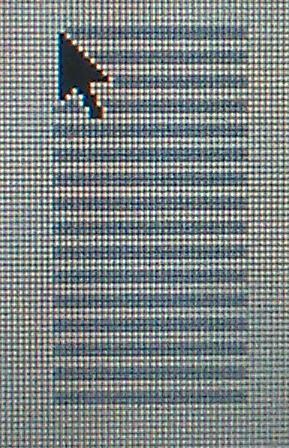 Also there the cursor has the same stripy pattern. Refit still boots and is usable, although I only get a black screen when it initializes the graphics card in "BIOS mode" most of the time. So I can control Grub only blindly, and I get no early boot messages from the kernel until the KMS driver loads. Neat workaround for the funny barcode cursor: use the SWCursor option of the radeon driver. Update: After a few months it got worse. With the radeon driver a lot of horizontal stripes and totally unstable. The machine would hang ever so often. Falling back to the xf86-video-modesetting driver works fine. I still get a stripy mouse cursor but at least it's stable. Seems it's time to replace this old buddy with a new one soon. All the best! Looking forward to a new Linux Install guide on the latest Macbook Pro.